Children and young people are very vulnerable to the effects of trauma because of their brain’s developmental immaturity. Now that we have a better understanding of the brains development, we can look at recognising and distinguishing the impact of trauma. Children and young people are very vulnerable to the effects of trauma because of their brain’s developmental immaturity. Because a child’s brain is so malleable, the impact of trauma is faster to manifest. It also leaves deeper tracks of damage. 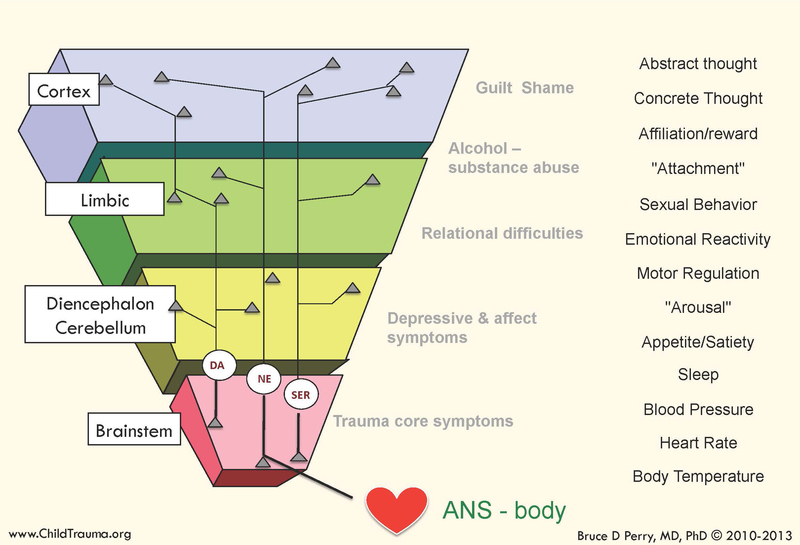 Children’s development can slow down or be impaired following trauma. What particularly influences what will be seen in how trauma manifests later in life is when it occurred during brain development, i.e. what age and which part of the brain is developing at that time. Here are some ideas on the influence of trauma experienced during the development of various parts of the brain. Limbic Kindling refers to the idea that avoidance will tend to make someone more avoidant. The limbic system learns that when avoiding specific triggers reduces arousal and increases survival, avoidance as a general strategy works and therefore becomes more generalised.